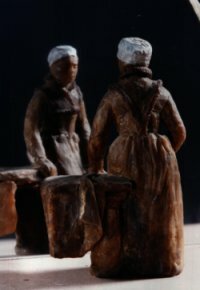 We usually subscribe to the idea that imagination is the most important quality in a work of art. We believe that imagination means not looking at life but drawing from ones' head. Rembrandt, Coleridge or Wordsworth, three imaginative geniuses, would not have countenanced that idea for one moment. But we, for several generations, have accepted this idea without question. It’s within our culture and it’s wrong. The physical relationships that Rembrandt set up for his live model groups were a necessary part of his creativity. He empathized through these characters and he observed the relationships he had created between them. This empathy, plus his profound observation of humanity and his stage production constitute the three aspects of his true imaginative genius. What Rembrandt learned about the psychology of humanity through his use of live models and their interactions with one another is an important part of our inheritance. Rembrandt can teach us to understand the human condition through observing body-language, and to see the psychological interaction between people. Rembrandt was able to perceive the spirit in the physical world and convey it in his drawings. This is his great gift to us. We cannot afford to allow it to be obscured. 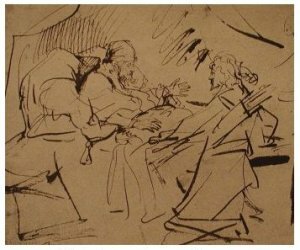 In the Isaac and Esau drawing we saw the two aspects of Rembrandt both from observation and from invention. In this final example (Jupiter with Philemon and Baucis) Rembrandt is drawing entirely out of his head. We see him so dissatisfied with the result that he has had to write the story on the right of the drawing. This drawing is so untypical of Rembrandt, no one would have thought of him as the draughtsman but for his recognizable script. 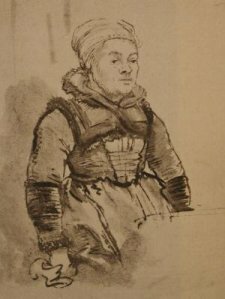 Click on the image above for a full treatment of this drawing and how it can teach us about Rembrandt's imagination, his character and his strengths and weaknesses as an artist. For Rembrandt "imagination" does not mean drawing out of ones head head. He always drew from life when possible. 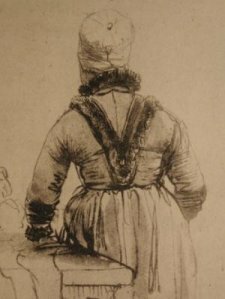 WOMAN IN NORTH HOLLAND DRESS - EXAMPLE SHOWING THE DIFFERENT QUALITY TO EXPECT FROM REMBRANDT WHEN DRAWING FROM REALITY AND FROM REFLECTION IN A MIRROR - AND HIS REFUSAL TO DRAW FROM WHAT WE CALL THE "IMAGINATION". Rembrandt produced a pretty ghastly life drawing. One of the most interesting things about Rembrandt is that he did not care. You know he is on his way somewhere. He does an awful drawing and puts it aside. Michelangelo would have had one of his bonfires and cleaned up his reputation. Rembrandt did not. As far as my own understanding of Rembrandt goes he is completely transparent. He makes no bones about his inability to draw without visual reference.